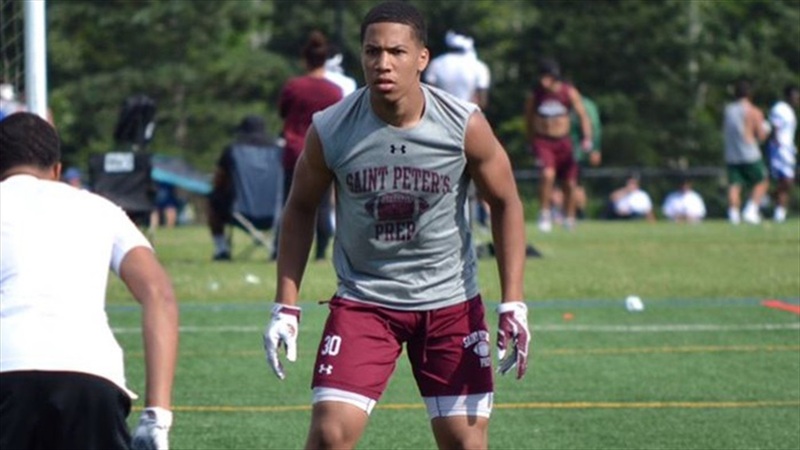 Given his experience with scores of elite football players, it only takes five words to know how St. Peter’s Prep head coach Rich Hansen feels about 2020 New Jersey linebacker Cody Simon‍. “Cody Simon is a stud,” Hansen says slowly and confidently. But the coach of the perennial powerhouse has many more words to add regarding Simon. “Cody Simon has tremendous football instincts, unbelievable work ethic and attitude,” he says. “He’s a really, really good athlete. He’s got outstanding speed and quickness. He’s going to play next year at about 220 inside for us and play some wideout. That gives you an idea the kind of athleticism he has. Simon has been recognized as such with offers from schools like Notre Dame, Penn State, Stanford, Boston College, Maryland, Rutgers, North Carolina and Pittsburgh. With four former St. Peter’s Prep standouts currently on the Irish roster, including his brother Shayne, Simon is well-versed on Notre Dame. “Obviously, he knows quite a bit about Notre Dame,” Hansen says. “But he doesn’t know quite a bit about Notre Dame relative to his situation there. He’s been there a bunch of times. It’s Shayne’s school, it’s the twins’ school, it’s Brandon Wimbush. And after Notre Dame visited the Jersey City school last week, it looks like that portion of the process will kick into gear within a matter of months. “We want to try to get him out there this spring and take a couple of days where it’s just his perspective on their plan for him, where he sees himself being for the next four, five years. They want him to see it through the eyes of Cody Simon and not Shayne Simon or the twins or anybody else.